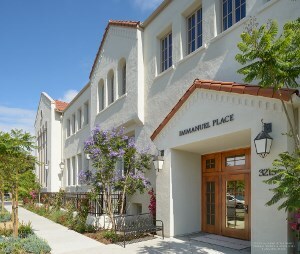 Immanuel Place is a 25-unit, tax credit community located in Long Beach, CA for people 62 and over. The waiting list is currently closed. Originally built in 1922, the former Immanuel Church housed traditional American Baptist Association worship services and was operated as a community center before becoming vacant in 2012. Now the development has been restored and transformed into senior housing while maintaining its architectural heritage. Many beautiful details of the former church were preserved including large stained-glass windows, huge exposed trusses, and the magnificent historic pipe organ. The existing sanctuary space was repurposed as a community room, consisting of a kitchen, library, and the fully restored pipe organ. Additional amenities include a secured entry with intercom, a fitness room, laundry facilities, and secure parking. The structures rich exterior fade and vibrant landscaping compliment the surrounding neighborhood. Residents have access to senior services, such as adult education, and health and wellness programs. Solar Thermal Water Heating: Solar thermal panels heat water by converting solar energy into low-cost, environmentally friendly thermal energy which decreases the dependence on gas or conventional electricity. Energy Star Efficient Appliances and Systems: Energy star high-efficient appliances including refrigerators, dishwashers, electric stoves, washers and dryers and the HVAC system conserve water and electricity while still maintaining high quality performance. Energy Efficient LED Lighting: LED lighting in community areas as well as in units provides bright light while using up to 80% less energy than other bulbs and producing far less heat than metal halides, CFLs, and incandescent light bulbs. LED bulbs last longer than other light bulbs, reducing the need to create waste by disposing of used bulbs. High Efficiency Showerheads and Aerators: Showerheads and aerators are low-flow to promote water conservation while still providing satisfactory water pressure and flow. Low-Flow Toilets: Toilets at the property conserve water by using 1.28 gallons of water per flush or less. Thermal Insulation: Thermal insulation maintains a comfortable temperature at the property while saving energy by reducing the use of the mechanical heating and cooling systems. Insulation used at the property is Greengard Indoor Air Quality certified, meaning that it meets strict chemical emissions limits which contributes to a healthy interior. Low VOC Adhesives and Paints: Low VOC adhesives, caulks, and paints contribute to improved indoor air quality by using reduced levels of the chemicals found in conventional adhesives and paints.